Asiatic lions are slightly smaller than African lions. Adult males weigh 160 to 190 kg, while females weigh 110 to 120 kg. The height at the shoulders is about 3.5 ft (110 cm). The maximum recorded total length of a male Asiatic lion is 2.92m (115 inches) including the tail. The most striking morphological character, which is always seen in Asiatic lions, and rarely in African lions, is a longitudinal fold of skin running along its belly. The fur ranges in colour from ruddytawny, heavily speckled with black, to sandy or buff-grey, sometimes with a silvery sheen in certain lights. Males have only moderate mane growth at the top of the head, so that their ears are always visible. The lions face the usual threats of poaching and habitat fragmentation. Three major roads and a railway track pass through the Gir Protected Area (PA). Also, there are three big temples inside the PA that attract large number of pilgrims, particularly during certain times of the year. There has been an increase in lion population, and more than 200 lions stay outside the PA. Though the conflict is not high now, with changing lifestyles and values these may increase in the future. 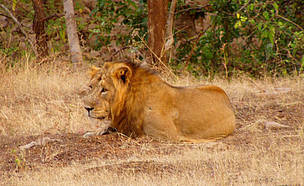 There are also cases of lions dying by falling into the unguarded wells around the Gir PA. The Asiatic lion faces threat of genetic inbreeding arising from a single population in one place. WWF supported barricading of 180 wells with local partners and Gujarat Forest Derpartment. This initiative led to doubling the subsidy by the Gujarat government and many farmers barricaded the wells with government support. To strengthen the efforts of Gir PA towards managing conflict and poaching, WWF provided need-based support. WWFIndia conducted study to assess habitat change over a period of 20 years.